Designing and outdoor kitchen is very similar to designing an indoor kitchen--the sky's the limit. 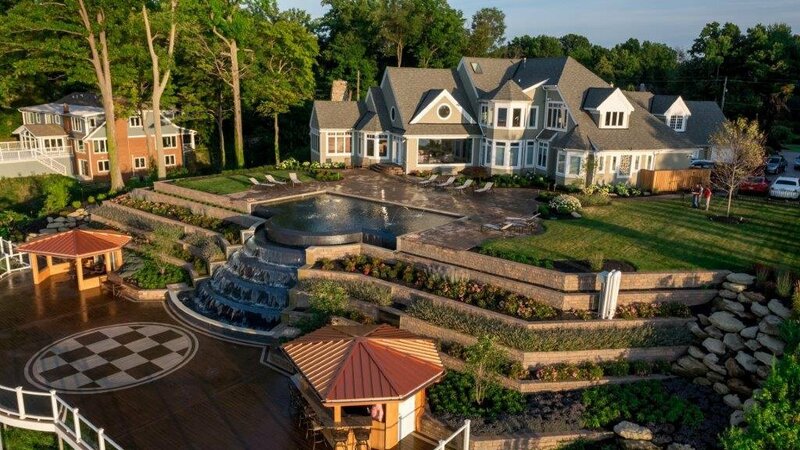 If you can dream it up, we can build it for you. You'll find that an outdoor kitchen gives you more entertaining options than you've ever had before. Instead of shuttling back and forth between your indoor kitchen and your outdoor grill, you can have everything you need at hand while you entertain, and you can enjoy summer to the utmost. But where do you start when designing an outdoor kitchen? We've put together a list of items to help you think through the entire process. Budget. Any landscaping project should begin with a thorough, realistic budget, and designing an outdoor kitchen is no exception. Professionally installed outdoor kitchens generally start at about $10,000. Even if you're not going to have the entire kitchen installed at once, you should prepare a budget that covers the entire project. We can help you with this. Materials. Just as there's a wide variety of materials available for indoor kitchens, you'll be surprised at how many materials you can use when designing an outdoor kitchen. Remember that outdoor kitchens have to do more than perform well while you're cooking; they also have to withstand summer heat, winter snow and ice, and gusts of wind. Therefore, durability is key. Consider using several different materials to add texture and interest to your outdoor kitchen's design: stainless steel, granite, flagstone, pavers, wood, tile, brick, and veneers, to name a few. Shade. In the heat of the summer, you may still enjoy spending time in your outdoor kitchen, but you'll enjoy it even more if you have some shade to keep you cool. If your yard doesn't provide shade from trees, consider ways to still have shelter from the sun. Pergolas, gazebos, and sun shades may provide the shelter you need while also adding to your landscape design. Lighting and Electronics. Today's technology allows us to use lighting and electronics in ways we never could before. Include a TV, stereo system, and automation in your design to create the ultimate in outdoor luxury. This allows you to host outdoor football parties and to create a wonderful ambiance for your entertaining. Appliances. Outdoor appliances are no longer confined to gas grills. As you're busy designing your outdoor kitchen, think about which appliances would be the most useful to you. Remember, the sky's the limit. You could include a built-in smoker, side burners, built-in grills, compact refrigerators, kegerators, wine coolers, beverage centers, ice bins and coolers, sinks, vent hoods, buffet servers, freezers, pizza ovens, and even searing stations. Fire Features. After a wonderful evening meal prepared in your amazing outdoor kitchen, what could be better than sitting around a fire with your friends and family. This, too, is a possibility if you include a fire feature in your design. Fire pits allow a large group to sit around a fire, or, if you like a more intimate (and vertical) setting, consider adding a fireplace. Seating and Dining Areas. When designing an outdoor kitchen, remember that you'll need a place to sit. You can always bring in a table and chairs, but you could also incorporate seating and dining areas into your hardscape. For example, your outdoor kitchen could include a countertop designed to accommodate bar stools for your guests to relax on while you cook. You can also include built-in benches in your overall design. 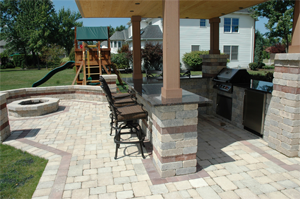 To learn more about designing an outdoor kitchen, call us and set up an appointment to speak with a designer. We can design a kitchen made especially for you.